designed by David A. Johnson, P.E. Over the years I have had to replace many dusk to dawn switches for outside lights. These switches turn on a light during the night, then switch them off during daylight hours. Some commercial switches are not sensitive enough to detect when the sun is out. Others flutter badly during the dawn and dusk switching transitions, burning out compact fluorescent lamps, which do not like rapid power fluctuations. Some are not sensitive enough to daylight, leaving the light on during most of the day. This occurs especially when the switch is on the north side of a house. Other times, the switch is so sensitive, that the light being turned on activates the switch, causing an oscillation. 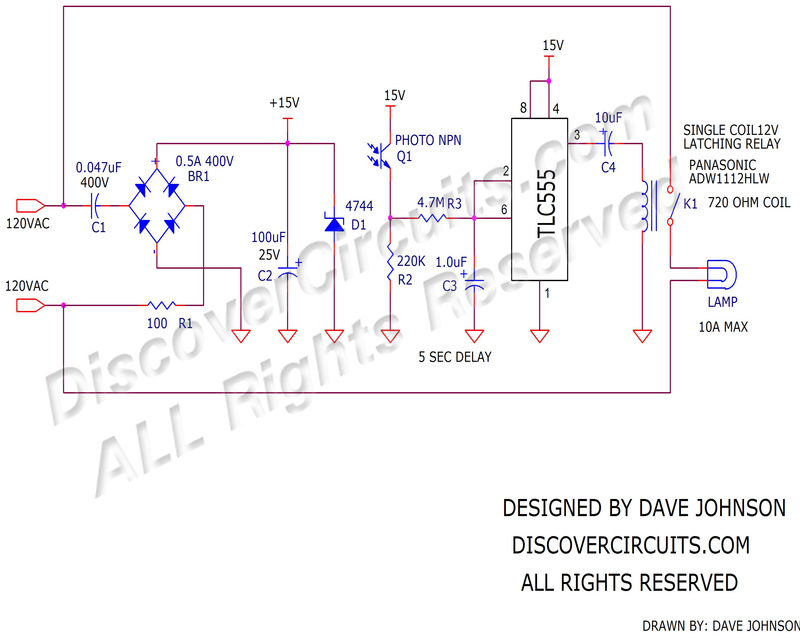 I wanted a simple reliable circuit which would turn on a light when it was dark and turn it off when light. I also didn’t want the switch to detect the light from the lamp it controlled. A Schmitt trigger switch action was needed, to produce a clean on/off switch operation. Also, a short delay might be nice to insure the light does not turn off from car headlights at night. The circuit below performs these operations. Instead of a CdS photoresistor, I used a photo-transistor as the light detector. I could then use a single fixed or an adjustable resistor to define the light sensitivity I needed for a specific light installation. Instead of a triac or some other solid state switch, I chose to use a DC latching relay. Such relays are very reliable and require only a short 25ms pulse to change their on or off state. The relay I chose had a single coil and could handle up to 10 amps of AC current. The circuit is powered by tapping into the AC power line. A “voltage dropper” type circuit is used to draw power from the AC line using a capacitor C1. The capacitor is connected to a bridge rectifier then to a capacitor C2. Energy stored in that capacitor is then used to power the rest of the circuit. I used a 555 timer as a Schmitt trigger. The timer was cheap and had a good output drive current rating, needed to power the latching relay. During daylight hours, the phototransistor Q1 conducts current producing a voltage across R2. When the voltage across R2 reaches about 10 volts, the pin 3 output of the 555 timer changes from a high logic state to a low state. This low state signal applies a negative 15v to the latching relay coil through a 10uF capacitor C4. Resistor R3 and capacitor C3 form a time delay, filtering out sudden light changes. During night, the voltage across C3 slowly drops. When the voltage reaches about 5v, the 555 timer output changes from a low state to a high state, applying +15v to the relay coil through C4. This change latches the relay coil, turning on power to the lamp. The resistor R2 can be selected for any desired light sensitivity.